The Heritage Alliance and The McKinney Center at Booker T. Washington School are joining together to produce the original, history based play, With These Hands. 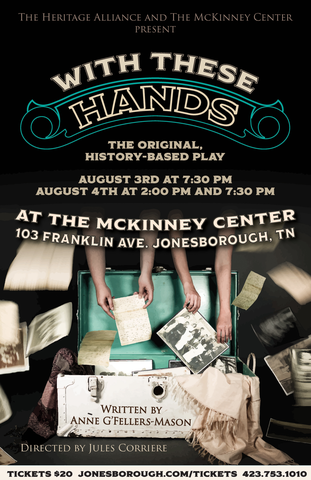 This full length “dramadey” will be a joint fundraiser for the Heritage Alliance and the McKinney Center. For the low cost of $20.00 per ticket, you will be supporting the educational programs of both organizations. To purchase tickets, please call the Jonesborough Visitor’s Center at 423.753.1010. Tickets can also be purchased online at jonesborough.com/tickets. This production, written by G’Fellers-Mason and directed by Jules Corriere, highlights significant moments in the history of Jonesborough and Washington County. It also features some of Jonesborough’s best-known residents, including town historians Paul Fink and Miriam Fink-Dulaney, Angelina Mason and Charlotte Dilworth, and many others, some whose legacy is found in street names and buildings, and others, in the work they built with their own hands that still stand today- the railroad, the courthouse, the steps leading to the Old Mill Spring. These are the stories of real people and real families through history, meeting at crisis points, and finding ways past them. “Their struggles in the past inform us of how we can move forward when we face these same kinds of obstacles. History is cyclical, but we can learn from it. Anne’s play is very timely. There are lessons inside. The Masons and the Dillworths bridged gaps over great divides, it was difficult, but they found a way, and we can aspire to their example,” says Corriere. The play may hold answers, but it asks even more questions- something that a good work of art always does. Can two families keep their friendship intact even though they find themselves on opposing sides of the Civil War? Can a former Southern Belle allow herself to accept help from a Freedman after emancipation? And the burning question- What is historic spit and what does it have to do with the Washington County Courthouse? These scenes and more will be brought to life on stage for one weekend only, in a multi-media production which will infuse historic archival photos, connecting the past to the present. This quote is applicable to many things, but chairmaker Curtis Buchanan applies it specifically to woodworking tools and techniques. 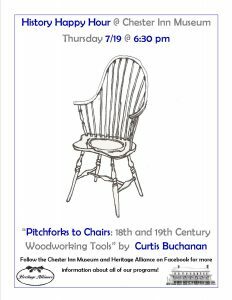 Curtis will be speaking about 18th and 19th century woodworking tools and techniques and the utilitarian items they produced at History Happy Hour’s program on Thursday, July 19th at 6:30 pm. 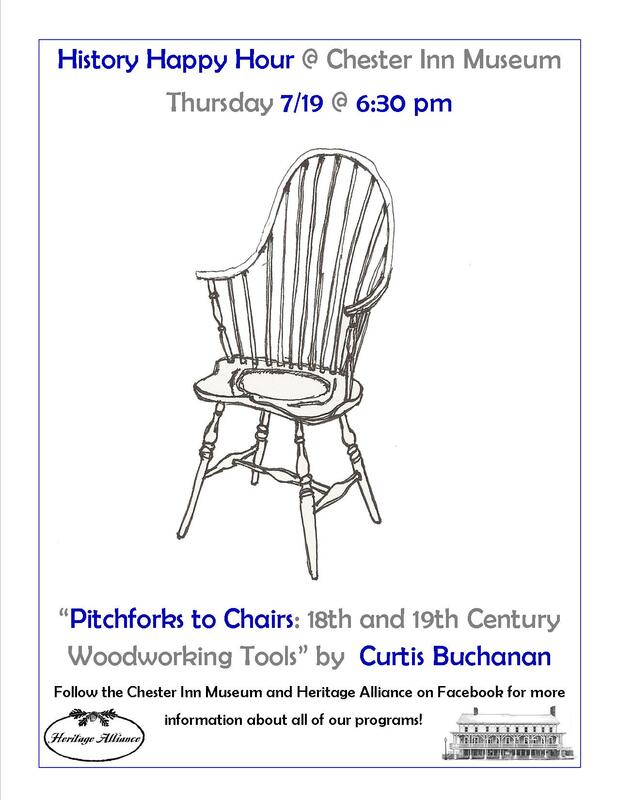 The program is usually held at the Chester Inn Museum, but this program will be held next door at the Christopher Taylor House, weather permitting. The program is free and open to the public. History Happy Hour is a collaborative program that features speakers and researchers from various local organizations, museums, and schools. Presenters for 2018 include independent researchers, National Park Service rangers, professors, and museum professionals from across the region. The programs are on the 3rd Thursday each month at 6:30 pm. For more information on the Chester Inn Museum, History Happy Hour, or the Heritage Alliance please call our office at 423.753.9580 or the Chester Inn Museum at 423.753.4580. You can also contact the organization via email at info@heritageall.org. Additional information about the Heritage Alliance and its mission can be found online at http://www.heritageall.org/. Be sure to follow the Chester Inn and Heritage Alliance Facebook pages for updates about events at the Chester Inn and other Heritage Alliance programs.